Woolworths has joined with celebrity chef, Kylie Kwong, to introduce a new ready-to-cook meal range. The meals are all Chinese-cuisine inspired and include dishes such as stir fried beef with black bean sauce and chilli sauce, stir fried chicken with cashew nuts, crispy chicken sweet and sour and vegetable fried rice. Kylie Kwong is third-generation Chinese Australian. She has published a number of cookbooks, has hosted her own television cooking show and has appeared on Masterchef Australia. Woolworths are also selling sauces as part of the Kylie Kwong branded range with black bean and honey and ginger flavours on offer. The supermarket says the new products are a response to Australia’s increasing appetite for Chinese food. Woolworths conducted research that revealed four out of five people want to cook restaurant quality Chinese food at home and 75 per cent would cook if it were easier to do. 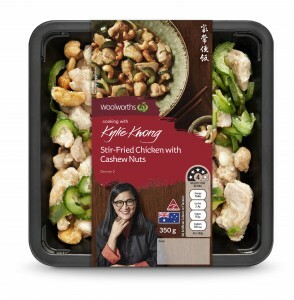 The Kylie Kwong range is available now at Woolworths supermarkets with prices starting at $4.99. Nestlé’s Uncle Tobys has launched a new range of oats in time for winter.